The British public are slowly waking up to the joys of cycling, a revered sport on continental Europe, and part of the appeal has been the exploits on both track and road of the Olympic and world pursuit champion Bradley Wiggins. The 2004 Athens 4km track pursuit champion won the hearts and minds of his hometown crowd when going all out in an attempt to win the 2007 Tour de France prologue, cheered on by a crowd of over a million. Wiggins had to settle for fourth on the day claiming he never once touched his brakes, other highlights of that Tour were his 5th place on the 13th stage time-trial at Albi and leading an ultimately doomed but nonetheless thrilling solo break during stage six. On the down side his team Cofidis were later thrown off the Tour when a teammate failed a dope test, Wiggins said at the time the Tour De France was discredited, but with distance has promised his new team T-Mobile he'll be back for it in 2009. 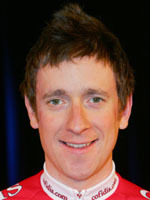 The son of a one day cycling specialist and born in Belgium, Wiggins first came to attention winning the 2003 world championships 4km individual pursuit. A year later, at the Athens Games, he beat his eternal rival Australia's Brad McGee to realise his boyhood dream of Olympic gold. "This gold medal is something I've wanted to do since I was 12-years-old and after watching Chris Boardman win the gold in Barcelona, it was something I decided then that I really wanted to win Olympic gold," he said. Out in Greece Wiggins also won a team pursuit silver behind Australia and a bronze with Rob Hayles in the complicated but viewer friendly Madison. Wiggins then turned his back on the track to concentrate on road racing until the run up to Beijing. With that in mind Wiggins went out to Palma de Majorca, Spain in March 2007 and regained the world individual pursuit crown beating defending champion Robert Bartko of Germany with relative ease in the 16-lap event. "Everything here is all about Beijing, and the world will be looking to see who's on form and who's not," said a triumphant Wiggins. "Next year could be my biggest ever," he said. "It could make the difference between having been a good cyclist and being a great one. He began the year in style by winning three golds at the 2008 world championships including his third straight individual pursuit title, the team pursuit and madison golds which all bodes well for Beijing. These triumphs came just months after his father was found dead in the street, from head injuries amidst mysterious circumstances, north of Sydney in Australia.